As many of you may already know, October 17, 2018 marks a monumental day in Canadian history. On this day, the Cannabis Act and its regulations (the Cannabis Regulations) come into force. With this law coming into force, Canadians will be allowed to enjoy several different cannabis products that they can purchase through various legal and regulated avenues. Along with the ability to purchase cannabis products, individuals looking to get involved in this lucrative market will also be able to submit various cannabis licence applications to the Cannabis Legalization and Regulation Branch of Health Canada. Once you’ve received this licence from Health Canada, you will be able to conduct various cannabis-centric activities that your licence authorizes. However, the licensing does not stop here. Many people may not be aware of this, but in addition to your Health Canada approved cannabis licence, you will also require a second type of cannabis licence that is issued to you by the Canada Revenue Agency (CRA) known as the CRA’s cannabis licence. 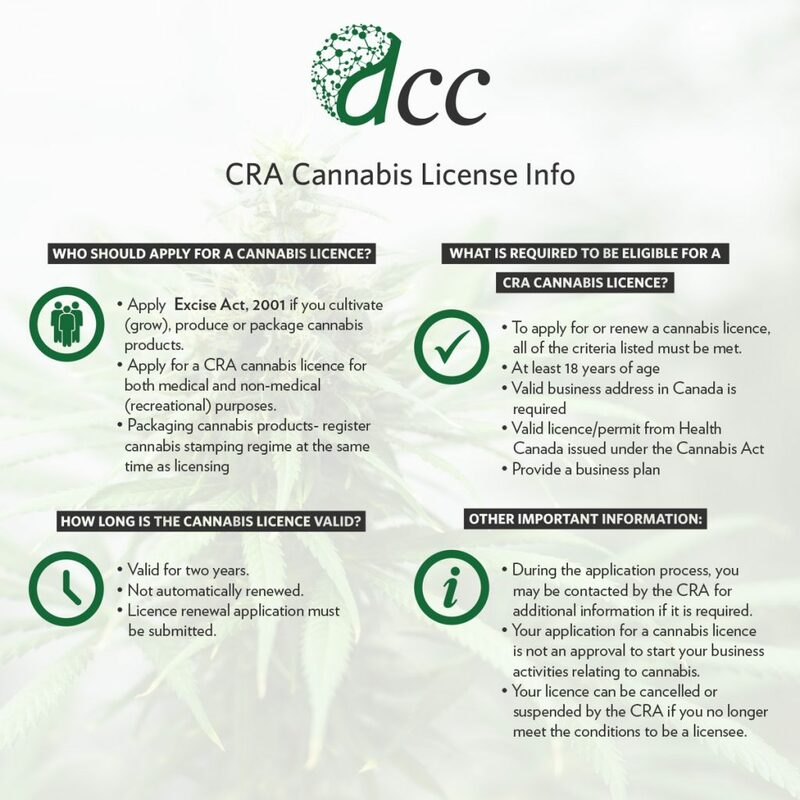 Below is some information that you should know if you intend to enter the Canadian cannabis industry with regards to the CRA’s cannabis licence. Who should apply for a cannabis licence? Under proposed legislation, you must apply for a cannabis licence under the Excise Act, 2001 if you cultivate (grow), produce or package cannabis products. Even if you have a Health Canada cannabis licence, you must still apply for a CRA cannabis licence for both medical and non-medical (recreational) purposes. If you are packaging cannabis products, you must also register for the cannabis stamping regime at the same time as licensing. How long is the cannabis licence valid? Once you’ve received your licence from the CRA, it is valid for two years. This licence is not automatically renewed and a licence renewal application must be submitted. What is required to be eligible for a CRA cannabis licence? Under proposed legislation, to apply for or renew a cannabis licence, there are a number of criteria that must be met. In order to be eligible, all of the criteria listed must be met. During the application process, you may be contacted by the CRA for additional information if it is required. Your application for a cannabis licence is not an approval to start your business activities relating to cannabis. Your licence can be cancelled or suspended by the CRA if you no longer meet the conditions to be a licensee. Although the application process may seem daunting, dicentra Cannabis Consulting has the experience and knowledge to guide you through the regulatory landscape to get you started in the exciting industry that is the Canadian cannabis industry. In addition to assistance with licensing requirements, dicentra also offers a number of other services to assist you with all of your cannabis licensing needs including the preparation of business plans. With this in mind and with cannabis legalization less than a month away, contact us to get ahead of the curve and to get started today!